This is an important stage in the narrator’s mental deterioration: she is moving from what a clinician would term ‘non-psychotic hallucination’ or ‘pseudohallucination’ to a fully psychotic presentation of symptoms. The reader will also recognise – at least on a second reading – that the ‘woman stooping down and creeping about’ is actually a projection of the narrator herself, who is either already engaging in her ‘creeping’ or ‘crawling’ ritual, or soon will be. The reader’s realisation that the ‘creeping woman’ is, in some way, the narrator herself invokes the suitably gothic notion of a doppelgänger. In the above quotation, the narrator states ‘I wish John would take me away from here!’ – and only nine lines further on she writes, ‘The faint figure behind seemed to shake the pattern, just as if she wanted to get out’ (273-4), establishing a clear connection between the narrator and this ‘woman’. As well, however, as being a mysterious double, the doppelgänger also acts in a way that foreshadows its subject’s future actions. A famous example relates to P.B. Shelley, whose doppelgänger was allegedly seen both by the poet himself and by another shortly before his death. 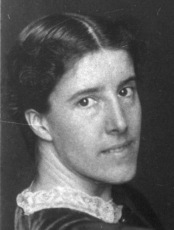 It is possible that Gilman intended her reference to the narrator’s doppelgänger to be similarly ominous. Given her remarkable insights into ‘incipient madness’, it is easy to forget that Gilman is writing a gothic short story, and the idea of the ‘creeping woman’ as a kind of vampiric doppelgänger, gradually feeding off the sanity of her victim until she is ‘freed’ from incarceration behind the pattern of the wallpaper makes for a fine tale of horror and suspense, and this approach unquestionably provides a valid alternative reading of the story. As is is finally ripped off and destroyed, it is as if the narrator finally gives up forever the mind that she has already ‘lost’ through her long obsession with the wallpaper; her own sense of herself is first supplanted and then silenced – and with that her tale tragically ends.